PRAGUE, 1 September 2015 – MAX Immo, the Prague-based real estate advisory, today announced that it has secured five new tenants, including Commerz Bank A.G., which together account for nearly 5,000 square metres of newly leased space at Charles Square Center, located at Karlovo náměstí (Charles Square), in Prague. 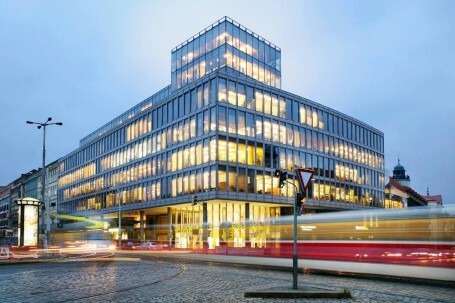 Max Immo was appointed as the exclusive leasing agent of the building in January 2015 by its owner, Germany-based fund Commerz Real AG, following the relocation of major tenant, Ernst & Young, at the end of 2013 leaving approximately 7,000 square metres of office space and approximately 800 square metres of retail space unoccupied. Throughout 2014, the space was offered on the “open market,” during which time any real estate agency could introduce potential tenants, though minimal leasing activity occurred throughout the successive twelve months. Charles Square Center is located in the city centre atop Karlovo náměstí metro station, (B-line), and adjacent to several key tram and bus lines. The building’s indoor retail area, the Atrium, offers several services for employees and visitors alike, including Billa, Teta Drogerie, Cross café, Sakura Sushi restaurant, and a post office.